Our latest research into intelligent operations reveals a customer first strategy is the biggest driver for C-Suite leaders today, so where more important to focus than what's going on at the call center? Has there ever been a more compelling time for call center service providers to step up and prove to their clients they can do a whole lot more than execute basic customer services? Call center services have matured significantly in recent years, where you can find a plethora of providers doing a masterful job managing resources all over the world to deliver affordable voice services - but choosing between them has often never been so difficult. However, with the need for so many enterprises to focus on the omnichannel customer experience to differentiate themselves, we're now in a critical bake-off between those call center providers delivering real customer value versus those still walking the treadmill of proving legacy voice services at ever-cheaper rates. Plus, we still have many enterprise buyers who squeeze the life out of their providers on cost, and then expect the provider's A team to show up. Hence, there is a fine balance between the value clients need, the investments they are prepared to make to achieve this value, and the ability of smart providers to invest in As-a-Service models that take advantage of talent, digital technology and automation to deliver high value, without huge increases in headcount investments. Sounds easy, right? This is a market undergoing a pretty dramatic transformation, in part due to increasing end-customer expectations - ambitious service providers are looking for ways to continue delivering operational excellence, while adding value and innovating to meet the expectations of their clients’ increasingly digital end-consumers. In the past, contact center service providers were valued for providing basic interaction services at a lower cost. As enterprises are more often now looking at the contact center in a much more strategic way, they are putting greater scrutiny and expectations on their service providers, looking to them to add value to their customers' experiences. Forward-thinking contact center service providers are not only aiming to help clients support customers using newer channels, but also to provide thought leadership and platforms that facilitate an “omnichannel” view of the customer, which includes consulting capabilities to design the customer experience, and actionable analytics that support predictive and proactive decisions with customer interactions. These providers are embracing the opportunity to deliver value beyond cost reduction, by transforming the contact center to an engagement and profit center with sales through service, increased levels of CSAT and customer loyalty. This has a profound impact on the needs for contact center talent, generating a major shift in the mentality and approach to recruitment and retention in contact centers. Despite these new dynamics, scale, flexibility and vertical expertise are also still key buyer requirements in the contact center space. Buyers commented, “it is their job to know the industry and help me figure things out”, and “we view contact center staffing like Uber when we need a ride.” Service providers are addressing these needs with flexible workforce solutions such as work-at-home agents, and with workforce management and optimization tools. Robust and holistic security measures are also incredibly important, especially considering some of the contact center security disasters that have been very public in the last few years. We covered 18 service providers in this Blueprint and interviewed many of their customers. One thing that struck us was that almost all of the buyers we spoke with were very pleased with account management and the execution of ongoing operations, but, on the whole, buyers found innovation and proactivity lacking, even in the leading service providers. There was a frequent disconnect between the service provider stories of innovation and the unvarnished client feedback from many of the reference calls. Despite many of the provider-offered case studies, most of the reference call discussions with buyers were examples of FTE-based engagements, heavily focused on traditional channel interactions. Clearly, this is a very mature market for servicing basic interactions on traditional channels, however, real life examples of omnichannel capabilities are few and far between. 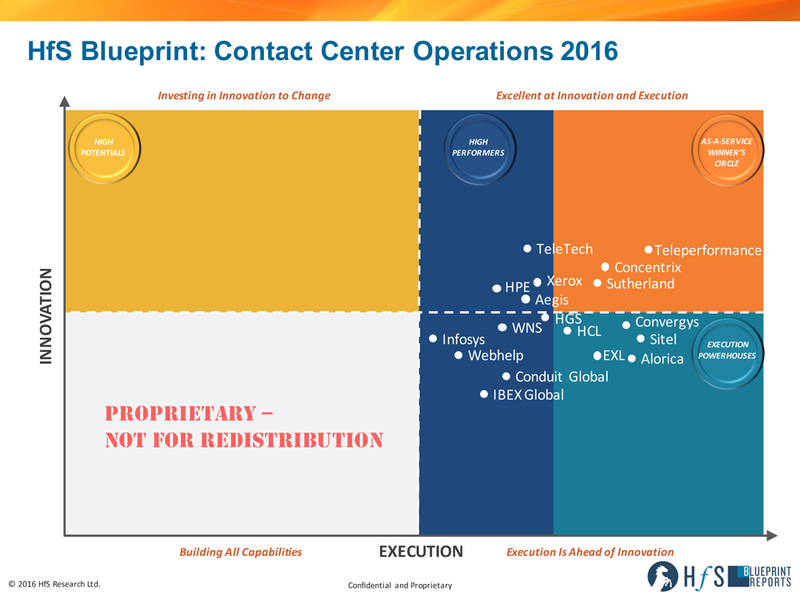 We are going to be doing a deeper dive on the Blueprint participants that are really implementing new channels, embracing automation and more advanced analytics in our upcoming “Digitally Enabled Contact Center” Blueprint. Who are the leading service providers in this market today? Teleperformance, Concentrix and Sutherland landed in our As-a-Service Winner’s Circle. Teleperformance is, by far, the largest provider in this space in both headcount and revenue, growing at an above industry average rate, and continues to invest in research and thought leadership to stay ahead of the game. Both Concentrix and Sutherland stood out for their endeavors to embrace the As-a-Service ideals, with Concentrix attempting to help clients write off legacy with technology partnerships and Sutherland demonstrating a real focus and vision for omnichannel customer engagement. One other common theme for the As-a-Service Winners Circle leaders was an effort to embed Design Thinking in client relationships. Each of the High Performers are approaching the market in innovative ways as well. Aegis, HGS, HPE, TeleTech, and Xerox are all working toward an omnichannel vision with clients. Conduit Global and IBEX Global both have solid execution and approaches to talent. Infosys, WNS and Webhelp are all broaching automation in unique ways. The Execution Powerhouses demonstrate strength in delivery execution, with Alorica, Convergys and Sitel boasting excellent talent strategies, and HCL and EXL performing well with solid account management and a focus on moving up the value chain. 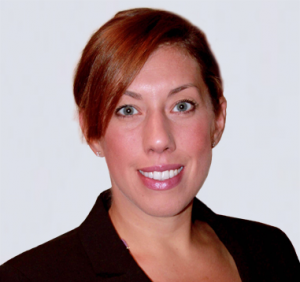 Moving forward, Melissa, what recommendations do you have for ambitious contact center service providers? 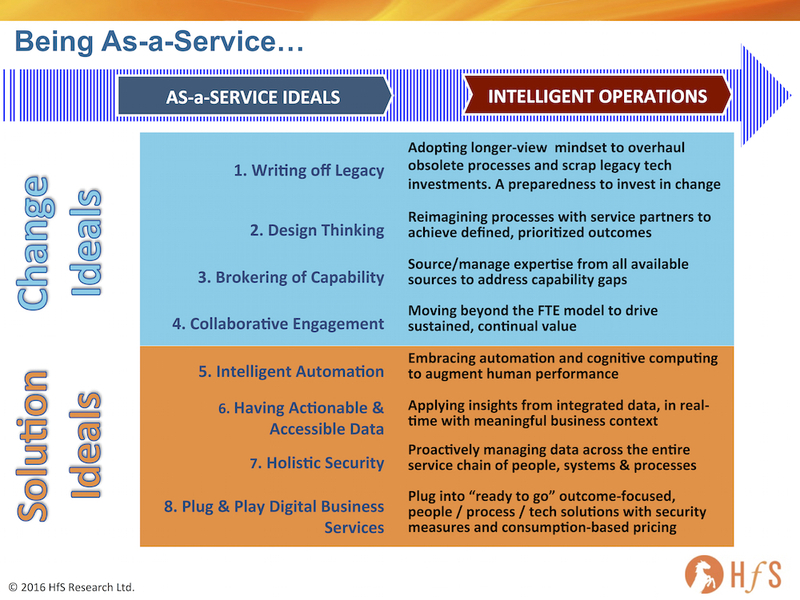 Contact center service providers must have their thought leadership and innovative ideas front and center of everything they do. Even many clients of our As-a-Service Winners complained of a dearth of innovation and proactivity. Buyers are no longer expecting providers merely to meet service levels—they are expecting insight and leadership as well, not just for process improvements, but also ideas around the bigger picture of improving customer experience. This can lead to better, and ultimately, expanded relationships. We also think there is real potential for Design Thinking to have a profound and positive impact on relationships in the contact center operations space, especially as it relates to the customer experience design needs, such customer journey mapping. Almost all the clients we spoke to scored their providers well in collaborative engagement, but Design Thinking presents an opportunity to take that collaboration to another level—and it just fits so well with the present needs of omnichannel design and customer journey mapping. Embedding Design Thinking into client/provider relationships can help facilitate ongoing discussions between (formerly) siloed groups to re-imagine business models that embrace digitally-enabled contact center operations. The leading service providers are starting to step up and embrace Design Thinking, but we need to see more focus on outcomes that have an impact on clients’ business. We also need to see Design Thinking embedded in the way call centers engage with clients from the outset, as opposed to a project-based billable consulting service. You don't buy Design Thinking - it is a mindset change that focuses everyone on defining, prioritizing and achieving desired outcomes. Most importantly, and something that the leading service providers understand well, is to continue to invest in and evolve a robust talent strategy. With all the movement toward self-service and all this talk about automation, people will still remain the most important part of the contact center, whether by designing customer experiences, analyzing customer behavior and demands, or having higher value real conversations. Contact center service providers need to work toward writing off the industry legacy brand, both as providers and employers. In order to do this, service providers need to change the perception of the industry, offering enticing career paths and focusing on analytical talent, and continue to increase strategic importance to clients. The service providers that can help their clients find the right balance of talent and technology in an omnichannel vision will be the future leaders in this market. Melissa O'Brien can be tweeted at @melissajaneob. HfS readers can click here to view highlights of all our 38 HfS Blueprint reports. See our plans for 2016 Blueprints here.